I'm delighted to share with you the final piece by Guest Artist Electra. 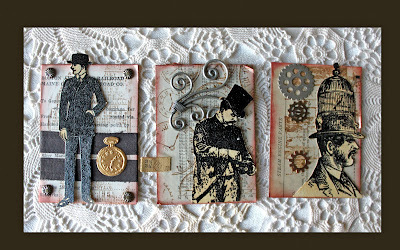 She created a lovely trio of ATCs using stamps from Studio 490 and Tim Holtz - Stampers Anonymous using the my Vintage Gentleman Kit. My Etsy Store is currently on vacation because so am I! But you can purchase this kit and more vintage book pages and ephemera when I return on August 5. And don't forget to enter the Vintage Gentleman Challenge for a chance to win at $25 gift certificate! I like the mix of texture and images. 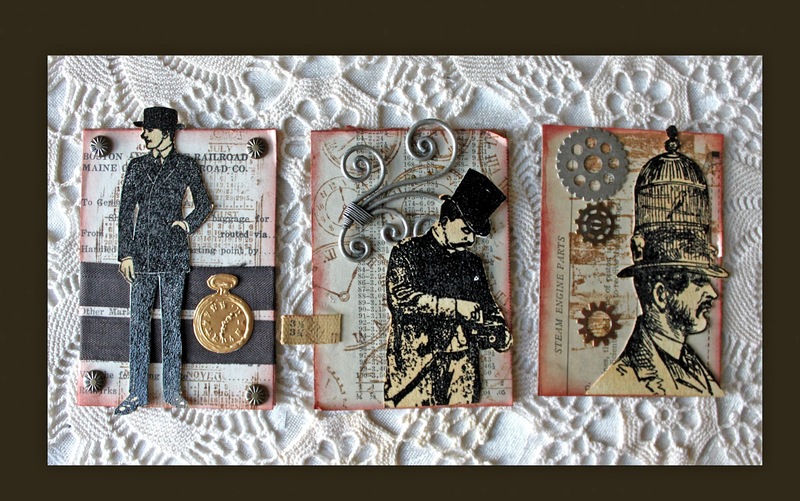 These ATCs are great, such a variety in images and design. What a brilliant trio - fabulous inspiration!